Beatles items were targetted at all kinds of fans of all ages back in the 1960s. For children who wanted to grow up to be a Beatles there was a range of toy musical intruments to help them on their way. This plastic New Sound guitar features images of the Beatles and even has plastic guitar strings. 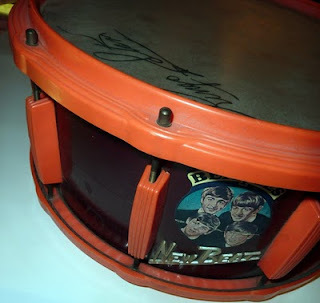 This New Beat toy drum features a replica Ringo Starr autograph on the drum skin and a colour Beatles image on the drum body.